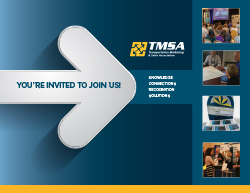 TMSA is the one and only association serving marketing, sales and communications professionals in transportation and logistics. All Are Welcome: For young professionals as well as executive level decision-makers. Stay Abreast of Trends: Grow professionally through education on emerging trends and issues. It’s Who You Know: Broaden industry networks and networking with mentors. Make A Difference: Create a real impact on your career, your business. The association was founded in 1924 as a railroad-based association. Years later, it broadened its mission include advertising professionals and it became the Association of Rail Advertisers & Marketers (ARAM), and then in 1998 became the Transportation Marketing and Communications Association (TMSA) with it expanded to all modes of transportation. In January 2011, the association further expanded its focus on sales and marketing, and formally changed its name to the Transportation Marketing and Sales Association. Today, TMSA's mission is to help its members and their companies make sales, marketing and communications strategies more effective, productive, and profitable.